One perk when it comes to growing your own food is that you can gather some of those fruits, vegetables and even flowers from the garden and turn it into wine. It’s satisfying to share a bottle of home grown country wine. Not all vegetables make a nice wine but carrots & parsnips are both wonderful. Of all the wines that we have made Carrot is the prettiest. It's a beautiful clear amber colour. What Does Carrot Wine Taste Like? This recipe makes a semi-dry white wine with a twist. It really does not taste like carrot. One word of warning: Root vegetable wines do tend to turn out stronger than fruit wines. Wait for the first frost before digging up your carrots or keep them in the fridge for a few days. This tends to sweeten them just nicely. You can also use a bag of store bought carrots but be sure to taste them to make sure they are flavourful. Scrub and roughly chop carrots into small chunks. Leave the skin on. Boil them in the water until softened. Do not over boil them, if they are mushy your wine will be cloudy. Strain the liquid into a sterilized fermenting bucket. Don't squeeze the pulp. This will create a cloudy wine. Add the sugar and stir. Cover with a large dish towel and let cool. Once cooled, add the pectic enzyme. Leave covered for 24 hours. Aerate by stirring vigorously. Add the remaining ingredients except for the yeast. Rehydrate the yeast by following the directions on the yeast package. Once the yeast is rehydrated add it to the bucket and give it a quick stir. Cover the fermenting pail with a dish towel and allow to ferment for five days. Aerate by stirring once per day except for the last day. You want to leave the sediment on the bottom of the pail so be careful not to disturb the pail on the last day. Carefully strain out the solids leaving the sediment in the bottom. Siphon into a 1 gallon demi-john, add an airlock and set aside in a cool dark location. Rack off into a fresh demi-john when fermenting (bubbling) appears to have finished: about two weeks. Add a fresh airlock and store in a cool dark location until the wine has cleared: About two months. 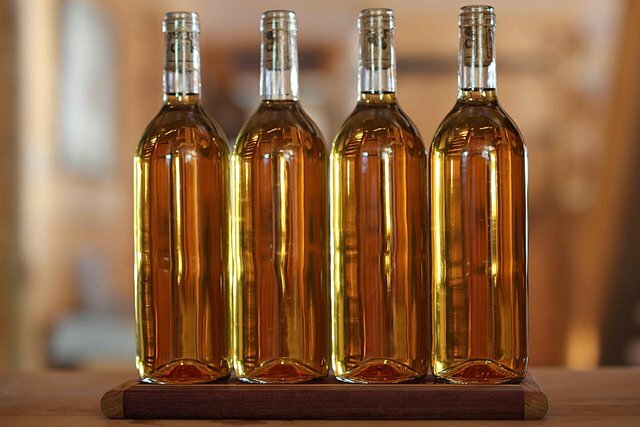 Bottle in sterilized wine bottles and allow to mature for at least six months before drinking (if you can wait that long). The wine really does change and improve in flavour with time. If you would like to make Parsnip Wine, you can find my recipe here. Carrot wine! I never would have thought. We've made homemade fruit wines and honey mead before, but carrot wine's definitely a new one for me. I'll keep it in mind. Definitely carrots are dirt cheap here. I will try this. Made so much wines even pumpkin but my berry wine always end up the best. The berry wines are quite lovely. I love blackberry. Pumpkin wine eh? How did that turn out? That's one I had not thought of. Pumpkin isn't suitable for wine. Much better to just roast it or blend it to a soup. Wow! I could never imagine wine made out of carrots. We tried making wine at home using grape juice and it turned out decent. But this definitely looks a lot more interesting. @kwlvarun we should give this a try! Thanks for sharing @walkerland :) Love your content! Following for more inspiration! Thanks @girlinchief I love your user name! I love experimenting and making things that people don't expect. This recipe is pretty common in England, its where I learned to make it. Parsnip wine is another well worth trying. The recipe is very similar. Thank you! :) In India, we do make a fermented probiotic drink using carrots, beetroots which is salty and sour in taste. I love it! This reminds it I should make it this spring. That sounds wonderful. I haven't fermented beets or carrots before but I will be sure to look up a recipe and try them this year. Thanks for the inspiration. If you happen to post a recipe let me know! I started making wine last year and made a lot of blackberry wine, some from salal, and some mead. I'm excited to try some different fruit and vegetable wines this year. I'll have to give carrot wine a try. I really enjoy blackberry wine. It's one of my favourites. It makes it sound like we are big drinkers ...(We aren't) but I just love making wine. this sounds amazing, like it could also be a super good-for-you winter time tonic, taken in small doses. maybe even warmed up in a crock pot with some extra seasonings! It might make a nice mulled wine forsure! That's a really good idea. I'm not so sure any of the healthy properties are left once it's turned into wine but it certainly eases pain and relaxes a person. I have a dream of having bees and then making mead. It's going to happen (the bees) this year. I think that would make it healthier in some way ... maybe? Tomato wine? Wow and I thought I had tried them all! What did it taste like? My husband loves Caesars but I hate drinking tomato "juice". It taste nothing like tomato juice. Its hard to really descried. Slight hint of tomato and citrus undertones, with a very mild fruity base. Very interesting. I think we'll have to give it a try! thank you. OOOh I've not heard of carrot wine, that sounds amazing, and I love your photos, so pretty! I have experimented with wild fermentation and my ultimate goal is to ferment using only things we produce ourselves. I've made apple cider with apples that I ran through my juicer, no added yeast or anything. It worked! It fermented into an alcoholic cider. It wasn't ultra flavourful, I think it needs a bit of sugar or honey for taste. I also made ACV this way and it turned out. Some of our experiments have been complete failures. Our dandelion wine caught a bacteria that smells like nail polish remover and there have been some very stinky sludge/goo concoctions as well that got buried in a hole. You might want to check out Pascal Baudar and his book: The Wildcrafting Brewer. I haven't bought it but plan to. I follow his facebook page and if you are into wild crafting ... his posts are beyond inspiring. Thanks for that info! I will be adding this book to my to read list. 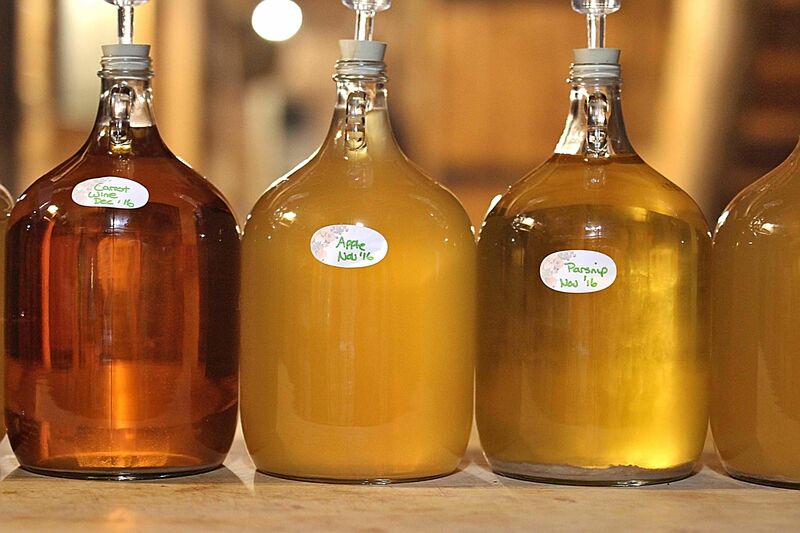 I just learned there is a wild winery nearby and I am planning to go there and have some drinks for inspiration :) How exciting that you were able to capture some good wild yeasts! Were you able to save them for future batches? To be honest, The jar that I saved turned to vinegar. I have a LOT to learn. That said I've got an amazing culture in there for future vinegar. I can totally relate. That happened to me with my St John's Wort beer last year. I kept experimenting with the yeast and tried to push it to ferment as long as I could without an airlock. Actually it went really far, over a month and then finally gave up and turned into vinegar. Now I have a gallon of St John's wort vinegar and it is quite tasty! St John's Wort beer sounds so intriguing and I am sure the vinegar is amazing. I am going to have to look into that. We are wanting to learn how to make beer. Its one thing we haven't taken a stab at yet. In my case brewing herbal beer is the same as wine... herbs, water & sugar, with your yeast of choice. In my case i was calling it beer because i didn't intend to age it and using beer yeast. I was following recipes in Buhner's book of Herbal Beers. If you have st johns wort handy I recommend it, it was tasting amazing even without being aged. that sounds like a really ideal way to experiment with beers. I don't really like the conventional style of doing things. This sounds much more up my alley. I'm going to look for that book. Thank you! Great information. Certainly want to give this a go. Thanks!